But Trump and a re-energized far right did not appear in a vacuum. Both of the capitalist political parties have made the persecution of undocumented workers the hallmark of their administrations. Under Democratic president Bill Clinton, much of the current infrastructure of immigrant repression was first constructed, from a militarised border wall to provisions for local police to act as immigration enforcers (287g of the 1997 Immigration and Nationality Act). Democratic President Barack Obama squandered a supermajority in Congress in 2008, failing to pass a promised legalisation program. Instead his administration carried out the largest deportation campaign since the 1950s. 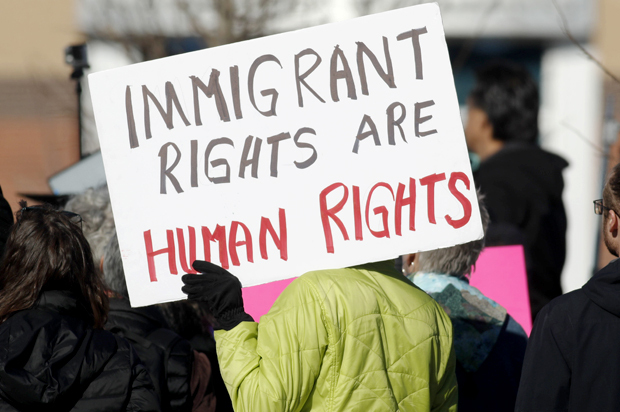 The bipartisan attack on immigrants over the last 25 years has served as a catalyst for the rightward shift in immigration politics, which opened the door for the election of Trump and the growth of a far-right fascist movement. What he failed to mention was that the United States government has already been targeting these predominantly Muslim nations through aerial bombings, proxy wars, drone attacks and a variety of other forms of clandestine warfare as part of the larger “War on Terror” — a generational effort to project US power and influence in the Arab and Muslim world. While claiming that this order is to “Protect … citizens from terrorist attacks, including those committed by foreign nationals,” the order ignores the fact that no citizens from these countries have committed any acts of terrorism on US soil. Rather, this is part of a long tradition in the United States of using immigration policy as another type of weapon in the empire’s arsenal. It should be noted that Trump’s attempted bans on people from countries such as Syria and Iraq reveal the depths of hypocrisy in US politics, as refugees from these countries are fleeing US-led wars in their countries. In 2015 and 2016, according to the Council on Foreign Relations, the United States dropped over 47,000 bombs on Syria and Iraq alone, killing untold thousands. On March 17 of this year for example, a US-led airstrike killed over 200 people huddled in a bomb shelter in a residential district in Mosul, Iraq, after allegedly targeting ISIS positions. Claiming Syrian and Iraqi refugees are therefore a “threat to national security” is the ultimate irony, as millions of Syrians and Iraqis have been displaced as a result of US policies. The most immediate threatening act of the Trump Administration has been a series of rule changes (“guidance memos”) that are currently being implemented by the Department of Homeland Security (DHS) under executive authority. The memos give a broader mandate for Immigration and Customs Enforcement (ICE) agents to arrest, detain, and deport undocumented people, as well as authorising them to act on their own impulses and target people more generally in the course of conducting their “duties” without restriction or checks. Anyone who cannot prove 2-year consistent residence can be put into the “expedited removal” process, regardless of criminal record. It should be noted that the union representing the Border Patrol (along with the National Fraternal Order of Police) officially endorsed Trump’s candidacy, showing the alignment of thinking within the 20,000 member armed border force. In other words, this order is designed to allow more impunity to the federal border police, a federal agency already accused of widespread human rights abuses. In effect, the Trump administration is encouraging the immigration police to go on the offensive and unleash a more far-reaching reign of terror on undocumented immigrants, which will undoubtedly increase and intensify state violence and abuse. The Arizona-based human rights organisation No More Deaths, for instance, produced a comprehensive report that documents 30,000 incidents where human rights abuses occurred between fall of 2008 and spring of 2011. Since 2010, according to the Southern Border Communities Coalition, forty-six people have been killed on the border. Another study conducted by the Kino Border Initiative (KBI), a bi-national organisation promoting humane immigration policies, found that about “40% of Mexican migrants deported from the United States said Border Patrol agents violated their human rights, and two-thirds said their families were returned to Mexico separately.” These daily abuses were committed during a period when the border police had minimal restrictions on their rules of engagement. ICE agents operating within the interior are no different, although their patterns of arrest have been more selective and targeted. There has been a spate of highly targeted arrests of undocumented immigrant rights activists – from California to Mississippi to Vermont, showing that a Trump administration is using armed agents in a more explicitly political manner than his recent predecessors. Through his Attorney General, former Alabama Senator Jeff Sessions, an unreconstructed southern segregationist, he is currently tangled up in the courts trying to bloc federal grant money from going to police in cities where Sanctuary provisions are on the books. In his current budget proposal, which has stalled in Congress, Trump has allocated $1.6 billion to begin extending the physical wall, currently at around 600 miles of the 2,000 border. Amid the tragic flooding of Hurricane Harvey, Trump took the opportunity to publicly threaten a federal budget shut down if the US Congress did not allocate funding for his wall. He also used his executive authority to pardon Joe Arpaio, a notoriously racist and anti-immigrant Sheriff based in the state of Arizona. By pardoning Arpaio, who had been facing prison time related to the unconstitutionality of his heavy-handed tactics of repression within Latino communities, Trump is signalling to his boiled-down, hard-right base and the Nazis who admire him that his tenure in office will be to re-establish racism and xenophobia as part of the mainstream of bourgeois politics. The function of racism as a means to specifically target and repress immigrant workers coincides with the extension of free-market capitalism. As corporations displace workers in their home countries, they become an even more exploitable commodity through their disempowerment as undocumented immigrants, who are purposely denied legal authorisation and citizenship rights based on their nationality and social class. Once in the country, state repression keeps them segregated and isolated. Trump has tapped into long and deep-rooted vein of anti-Mexican racism that has been part of US politics since its colonial inception. Trumpism is the latest exhumation of the “Brown Scare,” a particular form of anti-Mexican racism that is re-imagined in new forms in changing historical contexts, but most closely linked to the capitalist political economy. For example, 12 million Mexicans were residing in the country by 2007, primarily workers and their children. The undocumented workforce is now estimated at 5-7% of the national workforce and up to 20% of California’s labour force – distributed throughout many different sectors of the economy. It is in this context of “reconstitution” that we see the militarisation of the border, criminalisation of immigrant workers and the re-mainstreaming of anti-immigrant racism. To make US capitalism more competitive with its rivals, and more profitable, the US ruling class has ratcheted up its campaign to extinguish trade unions, drive down wages and extract more surplus value. Key to this strategy has been the repression of immigrant workers that has now become an institutionalised, bipartisan norm in US bourgeois politics, although the two parties craft their approaches and messaging differently. While Mexican and Central American labour is tacitly embraced as both necessary and productive, the criminalisation of their presence and denial of citizenship erodes their capacity to participate in activities to improve their wages and working conditions and fight for citizenship rights. By keeping a growing segment of the workforce non-citizen and vulnerable to persecution, capitalists can leverage down wages, more easily fire those who attempt to organise or speak out, and foster or exploit racial tensions as a means to divide and segment their workforces to pre-empt collective bargaining. The use of these tactics can weaken workplace organisation as a means to extract higher rates of surplus value from all workers. The most significant anti-immigrant turn towards immigrant repression was under the Democratic administrations of Clinton (1992-2000). Under Clinton, NAFTA was passed, simultaneously with “Operation: Gatekeeper”. This was the beginning of border militarisation – the initial phase of closing the border to the economic migrants under the rubric of the “War on Drugs”. The wall was extended, and there was a massive infusion of personnel, military technology and military strategy to control movement. This effectively pushed migration out of cities, into the deserts, mountains, etc. Over 10,000 people have died since 1994, roughly three times the number lost in 9/11 to put it in perspective, yet there is very little reporting in the media. Immigration reform was an issue Obama promised Latino groups that he would take up within his first “hundred days” in office. That didn’t happen. The narrative of the Democratic Party attributes the failure to Republican opposition and congressional gridlock. But a closer examination shows that the Democratic Party leadership allowed the Republican Party to determine the narrative and to effectively kill the possibility for legalisation. After this failure, the administration walked away from legalisation and instead became the most aggressive enforcer of restrictions in modern presidential history. The Democratic Party strategy under Obama was doomed from the start. During the campaign, Obama outlined the emerging strategy that would unfold under his administration. According to a campaign email, he believed that immigration reform must include a “three-pronged response”: 1) strengthen border security; 2) establish a path to legalisation that includes fines and adherence to the rule of law for immigrants and their families who may have entered the United States illegally but are now contributing and responsible members of society; and, 3) create a “guest-worker” program whereby US businesses can temporarily recruit foreign workers for jobs that US workers cannot or refuse to fill. Between 2005 and 2012, a period spanning the second term of George W. Bush and through the first completed term of Obama, the Customs and Border Protection (CBP) budget was nearly doubled, from $6.3 billion to $11.7 billion, while the ICE budget increased from $3.1 billion to $6.3 billion. The number of Border Patrol agents has increased from approximately 10,000 in 2004 to more than 21,000 in 2016 while the number of all enforcement agents, including interior operations, increased from 41,001 to over 61,354, including the vast expansion of ICE offices, field operations, and detention centres throughout the interior of the country. The greatest investment in the infrastructure of deportation has occurred under Obama. A substantial rise in deportation has not been an episodic or measured response to an existential threat, but a systematic and institutionalised means to police a whole population and fortify the lines of delineation between citizen and non-citizen. This explains why deportation has become a permanent and normalised feature of the immigration enforcement apparatus, irrespective of other variable factors such as the rate of immigration, crime, or state of the economy. It also illustrates continuity regardless of which party is in power. Beginning with Ronald Reagan and the passage of the 1986 Immigration Act, 168,364 people were deported; another 141,326 people were removed under George H.W. Bush. After even harsher restrictions were passed under Clinton, 869,676 people were deported during his tenure, followed by 2 million more under George W. Bush. After 8 years of the Obama Administration, the number of deportations has surpassed 2.5 million, even as the number of attempted crossings had declined after the onset of economic recession in 2008. This puts Trumpism in context. During his first 100 days as president, 41,898 were deported. While Obama deported less in the first 100 days of his last two years in office, more were deported in the first 100 days of his tenure in 2012, 2013, and 2014. This also puts into context Hillary Clinton’s position on deportation during her 2016 campaign. Attempting to outflank her rivals, she positioned herself to the far right of her opponents, pledging to “send home” over 60,000 Central American drug war refugees, mostly children, when she took office. Trump has begun to target those children now that their temporary protective status has begun to expire. In other words, Trump policies aren’t a rupture with previous administrations; they are a continuation. The main opposition to the politics of repression have come from the immigrant workers themselves. In 2006, there was a mass mobilization on a national scale against a 2005 federal bill (HR 4437) that would have made it a felony to be undocumented. More than 3 million people walked out of work and school and into the streets on May 1, 2006. It took on the character of a general strike in several towns and cities, as whole sectors of the economy were shut down. The US-Mexico border in San Diego-Tijuana region, the most crossed border in the world, was completely shut down by joint action on both sides. This killed the bill and made the struggle two-sided. Since then repression has increased. Nevertheless, we saw hastily organised protests in opposition to Trump’s “Muslim Ban”, which effectively closed some of the largest and busiest airports in the United States, leading to the ban being partially blocked in federal courts. We have seen the re-emergence of an immigrant rights movement, and now a developing anti-racist movement that is gaining traction nationally, with the slogan “no ban, no wall, sanctuary for all” being taken up by people around the country. While the struggle will likely intensify, we can see that it is possible to defeat the policies of Trump – so long as we also understand this is a project of both political parties and the 1% they represent.